Workplace learning helps businesses & students. Learn how at this FREE event. Click to register. What are the benefits of engaging students in your business? You develop working relationships with future local graduates who want to stay in the Valley. Students bring value to your business through new knowledge, insight, talent and skills. They can even point you to new markets. You get connected with the talent pool and resources at Acadia University and Nova Scotia Community College. And you contribute to the skills development and employment-readiness of post-secondary students. The region as a whole becomes stronger when these graduates enter the local labour market with skills and experience they gained in your workplace. Experiential learning is the process of learning through experience. “Co-operative education, internships, practicums, service learning, and class-based projects that incorporate real-life situations are some of the best examples of experiential learning,” says Michelle Larsen, manager of Co-operative Education at Acadia University. How can employers learn more? 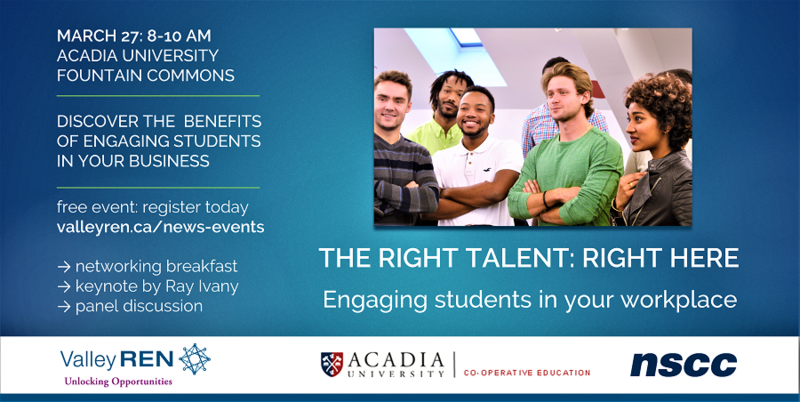 The Valley REN is hosting an educational event for employers on March 27, in partnership with NSCC (Nova Scotia Community College) and Acadia University Co-operative Education. This free event begins with a complimentary networking breakfast, followed by a keynote speech by Acadia University President, Ray Ivany. The main part of the event is a panel discussion with employers and students who have first-hand experience of workplace learning. Our panellists include John Read and Alex Sanford from Colibri Software in Wolfville and Michael Vaughan, manager of financial analytics, Western Zone, for the Nova Scotia Health Authority. This session will include plenty of time for Q&A. You can also explore a showcase of on-campus resources and opportunities for employer engagement with Acadia University and NSCC. Monday, March 27, from 8:00 – 10:00 am in Fountain Commons at Acadia University, Crowell Drive, Wolfville. We hope you can join us. Register today. Still want to know more? Read this article on the economic value of experiential learning. Follow our new Twitter account, Opportunities Now! @ValleyREN, as we share opportunities for business growth in the Annapolis Valley.